With every story I write, I spend hours brainstorming, researching, outlining, developing characters, drafting, and, inevitably, deleting thousands of words that end up going nowhere. And eventually … somewhere in that process … something incredible happens and I find the heart of the story. That little bit of magic that makes it come alive and turns it from words on my computer screen into something real. The thing that gives it breath and makes it unique from any other story I’ve written. Sometimes I find the heart of the story right away, like in The Passionate One. Sometimes it takes longer. I deleted almost thirty thousand words from The Ambitious One and rewrote the entire second half because it wasn’t working. Sometimes I still haven’t found it. I’ve been promising you the final book in The Billionaire Bride Pact for months. But The Hopeful One is still sitting in draft form, whispering for me to dig a little deeper, to find the heart of Nikki and Darrin’s story. Short romances are a quick-turn market. Sometimes I wish I could write as fast as some of my colleagues and release a book every four or six weeks. But, everyone has their own process and this is mine. I can’t get excited about something until I’ve put my heart into it and in doing so, found it’s heart in return. And I think I'm okay with that. 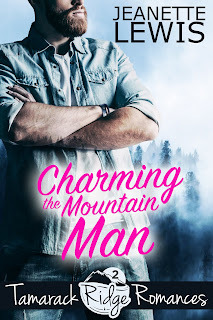 Check out my newest release - Charming the Mountain Man, Book Two in my Tamarack Ridge Romance series. The series is designed to be read in any order without missing any of the story, though you might have fun spotting crossover characters! This kind of stuff could happen, right? Lifelong enemies could become friends. Haters could become lovers. Very well said, Magdalena. I agree with you and Jeanette! And sometimes, the characters take the story in their own direction. Thanks for sharing, Jeanette. Jeanette, it is so true that every writer has their own process. I write longer books, and mine come out about every 6 months instead of six weeks. Although, right now I'm putting out three reverted books about six weeks apart. And welcome to the blog.